Pick Analysis: Looking at Smoot now, you'd never guess he competed in the hurdles at the USA Track and Field Junior Olympics. Dawuane (pronounced dun-WON) was a 215-pound end coming to Champaign, playing in seven games (eight tackles, one sack) as a true freshman. He added 40 pounds to his frame before his sophomore year, and that extra heft made him a more powerful player as a reserve in all 13 games (33 tackles, 7.5 for loss, 2.5 sacks). His game took another step forward in 2015, as he was named honorable mention All-Big Ten as a 12-game starter. He had 40 tackles, 15 for loss, eight sacks, and three forced fumbles on the year. Smoot was a team captain and a third-team all-conference pick in his senior season, being credited with 56 stops, 15 for loss, and five sacks. 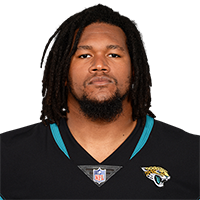 Jaguars all-time points leader Josh Scobee announces the Jackson Jaguars selection of Illinois defensive end Dawuane Smoot in Round 3 with the No. 68 overall pick in the 2017 NFL Draft.